1. In a large saucepan bring water to boiling. 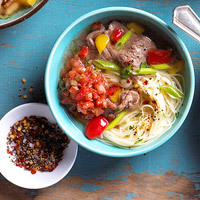 If desired, break up noodles; drop noodles into the boiling water. (Do not use the flavor packets.) Return to boiling; boil for 2 to 3 minutes or just until noodles are tender but firm, stirring occasionally. Drain noodles. 2. Pour oil into a wok or large skillet. Preheat over medium-high heat. Stir-fry beef, ginger, and garlic in hot oil for 2 to 3 minutes or until done. Push beef from the center of the wok. Add beef broth and soy sauce. Bring to boiling. Reduce heat and stir meat into broth mixture. Cook and stir 1 to 2 minutes more or until heated through. 3. Add noodles, spinach, carrots, and mint to mixture in wok; toss to combine. Ladle mixture into soup bowls. If desired, sprinkle with peanuts. Makes 4 servings. If using cooking oil, stir 1/8 to 1/4 teaspoon ground red pepper into oil. COOK pasta in large saucepan as directed on package, adding vegetables to the boiling water for the last 2 min. MEANWHILE, heat oil in large nonstick skillet. Add meat; cook until browned on all sides, stirring occasionally. Stir in dressing and teriyaki sauce; cook 2 min. or until sauce is thickened, stirring occasionally. DRAIN pasta mixture; place in large serving bowl. Add meat mixture; toss to coat. Stir together flavor packet from ramen noodle soup mix, 2 cups water, chopped green onion, and chopped fresh cilantro in a medium saucepan. 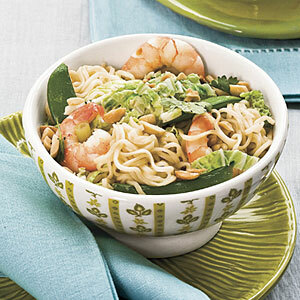 Bring to a boil; add noodles and snow peas. Cook 1 minute, and stir in shrimp. Cook 2 minutes. Transfer to a bowl, and top with shredded cabbage and chopped peanuts. Note: You can substitute 1/2 cup chopped cooked chicken for the shrimp. I saw this in a BH&G magazine and it looks yummy! We are going to have it for dinner next week. 1. Season meat with cumin, salt, and pepper; set aside. Heat 1 tablespoon oil in 12-inch skillet or wok over medium-high heat; add garlic, stir-fry 15 seconds. 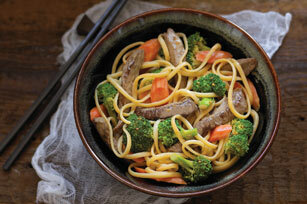 Add half the beef at a time; stir-frying for 2 to 3 minutes or until done, and setting aside. Return beef to skillet; add broth; bring to boiling. until pasta is tender. Stir in the 1.2 cup salsa and oregano; heat through. Ladle into bowls; twirl pasta into nests. Top with salsa and pepper mix. Makes 8 servings.